Somewhat hidden among the mansions of Pacific Heights are the Lyon Street Steps, a three tiered staircase made up of 332 steps, perfectly manicured hedges, and breathtaking views of the bay. A favorite among fit San Franciscans looking for a challenging workout in a beautiful locale, the Lyon Street Stairs get their name from the street that ends at their base and continues at their peak. Our favorite part? The courtyard style garden nestled on the second landing of the steps featuring a heart sculpture, a stone bench enclave, and perfectly pruned blooms. Enchanting enough as it is to stroll beneath the fragrant eucalyptus groves on Lovers Lane in the Presidio, happening upon Andy Goldsworthy’s Wood Line, a 1,200 foot winding line of eucalyptus logs, is truly mystical. Placed in an opening among the trees where Monterey cypress used to live, this simple, yet powerful sculpture visually leads you further into the woods and closer to nature. Surrounded by Monterey cypress trees, the sloping green hills of the San Francisco National Cemetery look out onto the Golden Gate Bridge and the San Francisco Bay. Dating back to 1854, the National Cemetery is the final resting place to over 30,000 Americans including Civil War generals and Vietnam veterans. We couldn’t think of a more beautiful place to rest in peace. Andy Goldsworthy’s first art installation in the Presidio, the Spire takes on a completely different feel than his second, Wood Line. Instead of quietly snaking through the forest floor, the Spire imposes its presence on the landscape, jutting upward into the sky like a spear. Constructed with aging Monterey cypress trees that were planted in the Presidio in the 1880s, the Spire reaches 100 feet into the air and symbolizes the cycle of life, death and rebirth via the new Monterey cypress saplings that have been planted around its base. The Spire can be viewed via the Spire along the Bay Area Ridge Trail. For a culinary experience coupled with beautiful views of the Golden Gate Bridge, visit the Presidio on Thursday evenings from 5pm-9pm or Sundays afternoons from 11am-4pm for Presidio Picnic, a traveling collection of food trucks, a bar, and music that transforms the 7 acre grassy knoll in front of the Disney Museum into a giant picnic twice a week. Just remember that this is San Francisco, so warm layers are recommended most of the year! 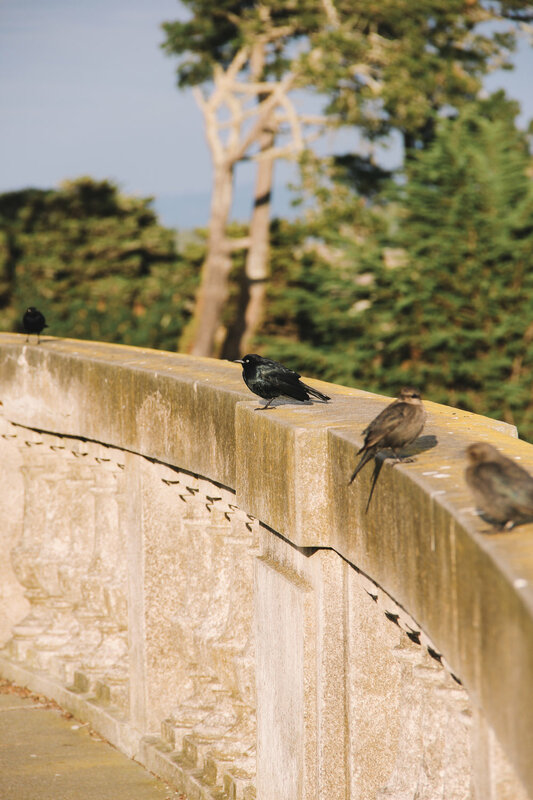 Perhaps the best way to experience the Presidio (it is a park after all), is on foot. With 24 miles of trails through eucalyptus, pine, and cypress forests, there’s no shortage of nature, and with 8 scenic overlooks, there’s no shortage of distractions. If two wheels are more your style, try the 25 miles of bikeways that traverse the park. You’ll be hard pressed to find a more scenic indoor climbing experience than that of Planet Granite. Located between the border of the Presidio and Crissy Field, Planet Granite’s rock walls look out to the bay and the Golden Gate Bridge. On nice days the staff opens up the glass paneled doors to let in some cool, ocean air. Originally restricted to military officers and club members, this historic golf course is now accessible to the public and offers yet another great way to experience part of Presidio National Park. For some of the best views of the Golden Gate Bridge (think waves crashing over rugged boulders in the foreground of your photo), head to Baker Beach on the west side of the Presidio. With a mile of sandy beach to choose from, there’s plenty of space to lay out your picnic blanket, enjoy the views, and relax on a sunny day. 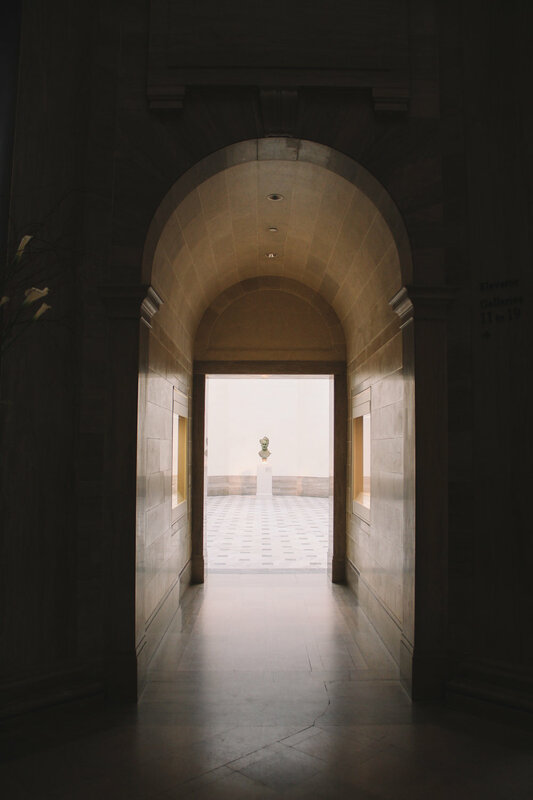 A French Neoclassical building perched above the Pacific ocean overlooking the Golden Gate Bridge is the Legion of Honor, one of two fine arts museums in San Francisco. Come here to view Rodin’s monumental sized “The Thinker”, impressionist works by Degas and Monet, or a vast collection of ancient art. For Star Wars fans, a visit to the 32 acre LucasFilm campus is a must. While there are no tours available (the campus is a working production facility), visitors can stroll 17 acres of landscaped, public property and take a picture in front of the yoda fountain that marks the entrance to the campus. Disney fans will love the Disney Family Museum, a museum dedicated to the life of Walt Disney and his expansive works.